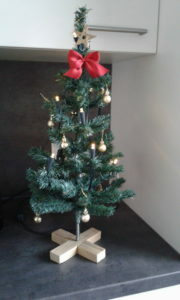 Our Christmas Tree in the staff’s kitchen: fake tree, LED candles and small enough to fit on the counter so no one bumps into it. The most difficult season for the registrar comes to an end. All the end of year gifts wrapped up, all the loans returned or loan contracts renewed, all the candles replaced with LEDs (seriously, who ever thought mixing real – and usually dry – twigs of pine and fire is a great idea? ), the last database entries updated. Time to raise our glasses. We know the world “outside” is difficult, perhaps more difficult these days than it ever was during our lifetime. But there is also friendship and collaboration across borders, especially in our profession. That’s something to be grateful for. This year sat colleagues from all across Germany, but also from China and Egypt at our kitchen table in the storage and we could exchange thoughts and insights. Maybe the greatest gift is being able to listen and understand each other, even if there are language hurdles and cultural differences. Happy New Year Angela and colleagues, from rainy Amsterdam. And thank you so much for all the good work you are doing with this blog! It’s a pleasure to read, food for thought and a useful resource all rolled into one. Frohe und schöne Weihnachten, kellemes karácsonyi ünnepeket, god jul & merry christmas to you all! Fröhliche Weihnachten! Angela from Fair New Mexico! Merry Christmas Angela! I am fortunate as year end for government comes March 31st. A more reasonable time. Merry Christmas and a happy new year to you, too!